Wedding is the most exciting event for two loving hearts. This day must go fabulously and perfectly, because every girl dreams of being a princess on this day. Therefore, the ceremony of the wedding is important to think over to the smallest detail. Starting from the venue, finishing with the bride's bouquet and the groom's buttonhole. Boutonniere in translation from French boutonnière literally means a flower in buttonhole. It is believed that for the first time the boutonniere was attached to his wedding jacket by the Prince of England - Albert and since then it has become an important wedding paraphernalia for the groom. But there is also a version that first began to use the young man's boutonniere in ancient Greece. On the day of the wedding, the flower, which was as a guard from the evil eye, pinned them on the chest. To date, the use of the buttonhole has several rules. For example, if at the wedding, in addition to the groom, the buttonholes are attached to several male guests, it is possible to determine which of them is single. Married men fasten the buttonhole on the right side, and unmarried men on the left. How and how to mount a buttonhole? Boutonniere of the groom is traditionally fixed with an ordinary pin. It can also be sewn in advance with a few stitches. Usually, this is what happens with the boutonnieres of witnesses. What is the wedding boutonnieres? Naturally, it is not a secret to anyone that the buttonhole first of all consists of flowers. For the groom's buttonhole, the same flowers are selected as for the bride's bouquet. They should be the same shades to look harmoniously together. Of course, when selecting flowers and for a bouquet, and accordingly for a buttonhole, one must be guided by the knowledge of the language of flowers. 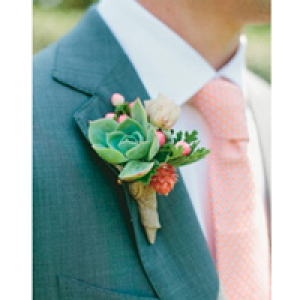 In spite of the fact that the groom's boutonniere and the bouquet of the bride should appear to be a single whole, it is worth adding some kind of individuality to the decoration of the buttonhole. Then such a flower union will not be boring, but will be painted with bright and interesting accents. If you decide to observe all wedding rituals and traditions, then you should also know about the ritual with the buttonhole. Initially, the boutonniere should be at the bride's. And only after all the tests, bride price and other traditional rites, the bride must attach a buttonhole to the groom's jacket. Boutonnieres with their own hands: Is it difficult? The most important component of the boutonniere is flowers. It is important to pick fresh, because they are needed for such an important wedding attribute. If you choose flowers in the store, pay attention to the base of the flower. If it is soft, then the flower is not fresh. If the base is solid, you can buy with a calm soul. And if you do not have time to look for fresh flowers in the store, the flower delivery service Buket Land will take you the freshest flowers straight home! After you have chosen the flowers, cut the stem for a couple of centimeters and put it for a short time in a vase of water in a cool place. You can also sprinkle the flowers with cool water, this will give them freshness. After you have given flowers, take a garden pruner and trim the stem, leaving only a couple of centimeters from the base of the flower. Why is it better to use a garden pruner, not scissors? The fact is that scissors can damage the stem or shatter it. Next, you should tear off the upper petals in the event that the flower is magnificent and very much voluminous. It must be done very carefully and carefully, so that the main petals of the flower do not fall off. After that, you should take a special floristic wire and pass it at the base of the flower. The length of the wire you need to create a buttonhole is about 10 cm. Then take the tape and wrap the wire around it, do it carefully, without touching the leaves of the flower. This is the basis of your boutonniere! Then you can add everything that fantasy tells you. The main thing, remember that everything should be harmonious and in moderation!